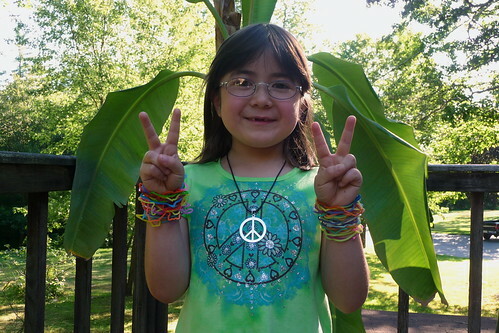 I lent Dova my new peace symbol necklace to go with her new peace symbol shirt. Wearing tie dye shirts recently made me hanker for a nice peace symbol necklace from the seventies. Luckily, eBay is always available to quickly satisfy those cheap whims. So what's peace child to do? Commune with nature of course. 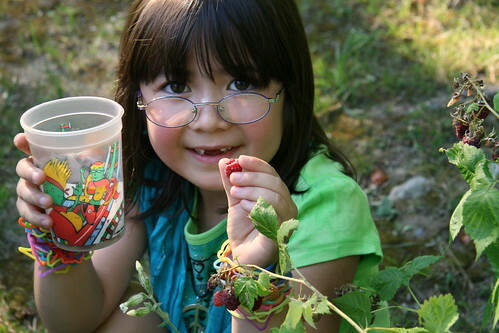 Here is my love child picking raspberries from our yard. And eat them straight from the vine. Since we do nothing for pest control or even fertilizer, they are completely organic is every way. I've taken to call her moon child (and sometimes Moon Unit) every time she wears this shirt. It fits her perfectly. a rasberry cheeked complexion, too! 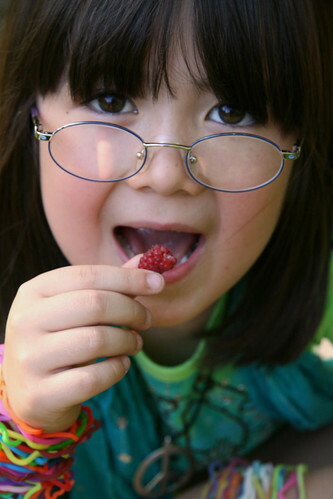 She's so cute.. love the picture of her eating the rasberry. Hi Angela, nice to see you. Been a long time :) Dova is beautiful and they are great shots! Freshly piced berries are the best.